On our recent vacation I saw a fun example of storytelling. I had been looking forward to hearing more bedtime stories from grandpa at the Stewart family reunion, but that didn't work out this time around. He did tell the kids a good long story in the daytime, though, I'm happy to say. 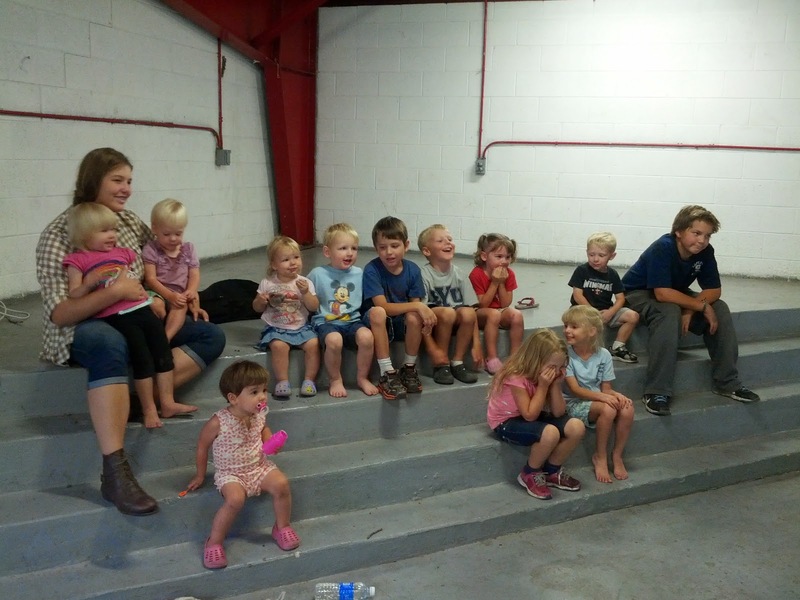 At the reunion there were a baker's dozen cousins and most of them were under 6 (see photographic evidence below). We had an evening up the canyon and had some songs from grandpa, an awesome family tree activity, and a cook out. The event that stole my heart, though, was a quick story that grandma told the kids while Uncle Jonathan got something out of the car. Grandpa announced to this crew, "Ok kids, Grandma's got a surprise for you!" . "No, I'm not ready yet." Grandma said. Then she whispered with Uncle Jonathan and sent him to get something. "Ok kids, everybody come sit down. While we wait I will tell you a story..."
She told the story, a long joke really, about a wide mouthed frog. It was great, with the physical element. I loved the story and the kids did too. After that, Levi was playing around talking like a wide mouth frog. The killer thing is, I can't even remember what the "surprise" was that came afterwards. Haha! Have you heard the joke before? If you had to entertain this crew for a few minutes, what would you try? After you comment, visit (or re-visit) another post about storytelling, and more info about Story Club (the e-book I'm working on). I don't think I could ever let myself be in a situation where I had to entertain 13 kids at once ;) But your last Story Club post got me thinking, and when faced with a whiny kid that I was trying to keep on the potty longer, I said that we were going to do a Story Club. Addison was enthralled with my part of the story, and I was relieved that she had to do some of the work too because I'm far from a storyteller by nature. Addison has asked for Story Club every night since, and even started making up her own rules: "We have to shut this door before we begin our Story Club." Looking forward to the ebook! Hahaha! I love it! Oh, she is going to do wonderfully in school. Rules and rituals reign there. Thanks for the extra motivation! I need it right now.